If you find the word "hell" in the Bible, you know it's a translation. The word is neither Hebrew nor Greek, and the current sense derives from Scandinavia. In Norse mythology, Hel was the witch queen of the kingdom of death, which was also referred to as Hel. It was situated in Nifelhem or Niflheim and represented the bad place to go, Valhall being the nicer option. Though the myths of the vikings are often quite vague (much more so than many verbose descriptions can make you believe), there is no doubt that Nifelhem is a cold place indeed. So the next time you hear someone talking about "when hell freezes over" -- it's always been that way, etymologically. ... In Norse mythology Loki's daughter, who rules over the evil dead in Niflheim, the lowest of all worlds (nifl "mist"), a death aspect of the three-fold goddess. Transfer of a pagan concept and word to a Christian idiom, used in the K.J.V. for O.T. Heb. Sheol, N.T. Gk. Hades, Gehenna. The Hebrew word was geéenna, don't know the original spelling but in the Greek of the New Testament it's written γεεννα and the Latin form is gehenna. It derives from "the valley of Hinnom," Ge-Hinnom, south of Jerusalem, where ungodly rituals had supposedly taken place, and as such it was used in several prophecies as a symbol for paganism and its punishment. The association with high temperatures is there early on, and firmly in place at the time of Jesus. When someone many years later translated it into hel, the same association had apparently overruled the old cool one of the vikings. So you could also say that hell was frozen over a thousand years ago, but has since thawed considerably. 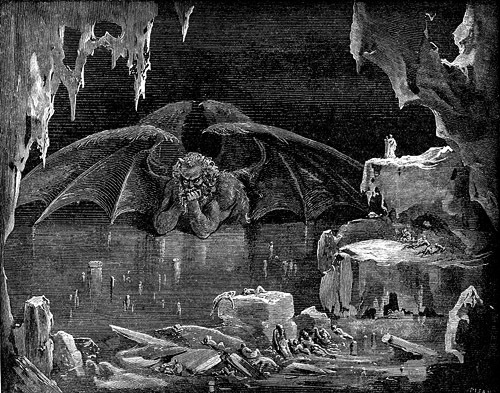 I don't think Dante Alighieri had the hell of Hel in mind when he described the ninth and final circle of Inferno, but his ultimate Hell is indeed deep frozen; Satan himself is trapped in the ice, chewing on Judas Iscariot, Brutus and Cassius.